Minnie, Katie and I had a nice afternoon being around all the other Beagle enthusiasts at the B.O.N.E.S Beagle Bash held in Auburn, MA. Katie and I went last year, but didn't take Minnie with us because I didn't know how she would react to so many dogs - especially her own kind -and I had wanted to check it out myself before bringing her. I shouldn't have had any concerns because she went with us this year and I think she wasn't impressed with the whole event. We got to see a short presentation from a K-9 unit using her Beagle to sniff out suspicious smells in luggage. That was pretty interesting. 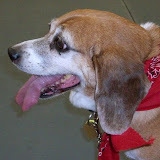 We also got to see a Hop Along Cassidy 3-legged Beagle all decked out in his cowboy outfit. The theme this year was something about cowboys, but I didn't see too many people dressing up their dogs. Thank God. I threw a red bandanna around Minnie, but that's about it. Minnie isn't into costumes. She's more into food. Minnie was exhausted by the time we left and she came home to only nap the rest of the afternoon away. This was the scene of my big excitement today. I was going to the groomer to pick up Minnie from her bubble bath and came across this hot mess. The Toyota was brandy new and the guy driving it was a Papa Gino's pizza delivery guy just trying to get someone one of their pizza's for lunch. The man driving the Honda SUV apparently jumped out of his truck immediately after impact, but after finding out the guy that hit him was working for Papa Gino's that's when he started to feel all tingly and needed medical assistance. 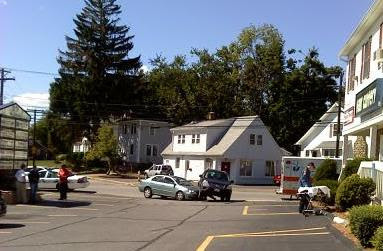 The irony of this incident is where it happened - right in front of an EMT training center. So by the time I gathered Minnie and we were heading for the car, the EMT class was getting out and let's just say they were interested in a little hands-on training. 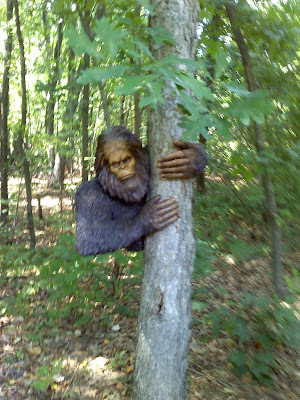 Apparently this BigFoot is so life-like that a little visitor named Olivia quickly ran inside the house after seeing the monster hiding behind the tree in my mother-in-law's backyard. She even tried to lock the kitchen door because she was afraid the monster was going to get her. How cute is that? Her brother was wondering why there weren't any foxes in the woods behind the house? Spencer remedied the situation by promptly buying a nice resin fox from Design Toscano. Can't wait to see their reaction the next time they visit The Perry's. 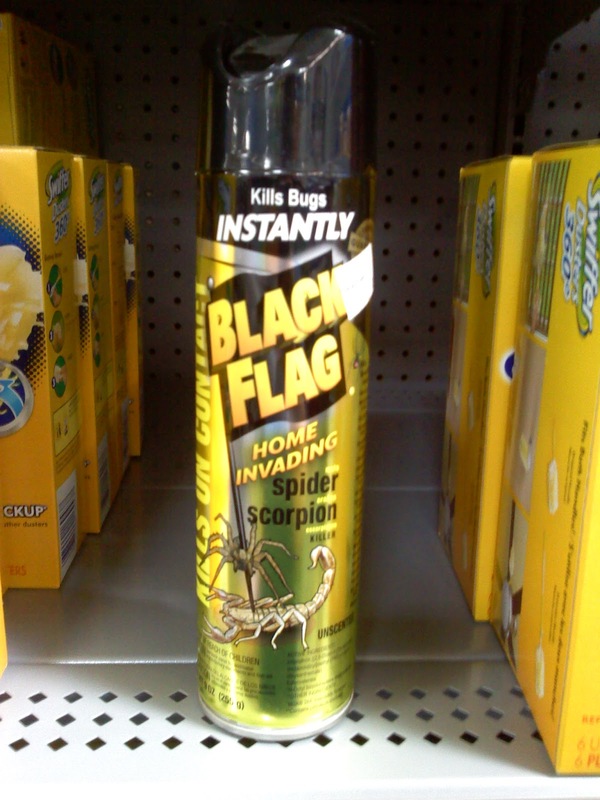 Spencer happened to see this can of Black Flag sitting on a shelf in the pesticide section at the new Super Wal-Mart in Worcester. This must be a misplaced can because I've never heard of scorpions being indigenous to Massachusetts.